BacktoFrankBlack regular contributor Alison Nastasi has done a wonderful little article about Pumpkinhead, the cult horror staring Lance Henriksen. Since there is I doubt absolutely no one following this campaign who isn't a fan of Lance's work, we felt you'd like to indulge in a little article read with your coffee. 1 Response to "Pumpkinhead Revisted"
Wow! 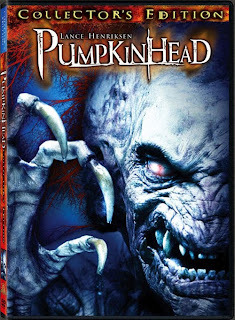 1988 is when Pumpkinhead was released. I'm feeling old. I'm not really a big fan of horror films but I do remember this one as being a cut above most.